Integrity Monitoring detects changes made to the system, but will not prevent or undo the change. Apply the Integrity Monitoring rules. Build a baseline for the computer. 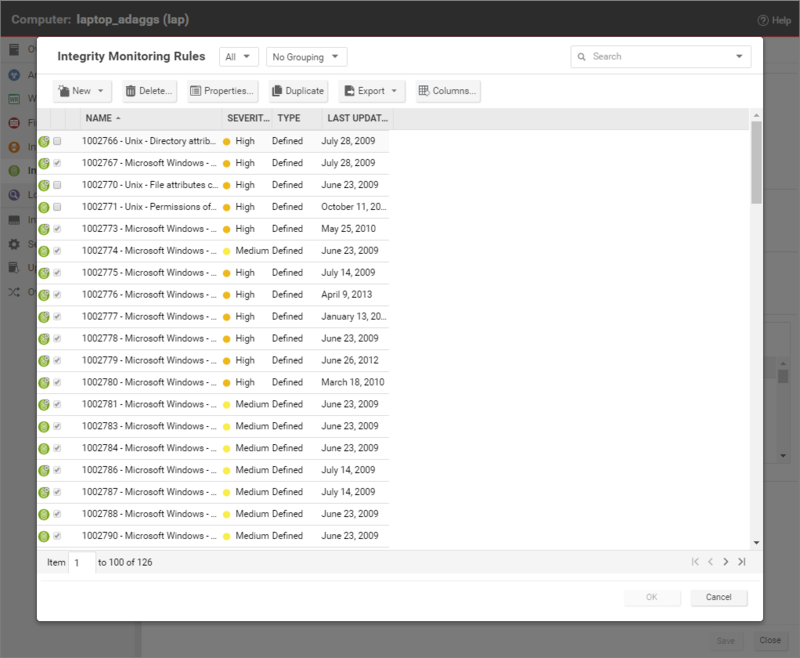 If you have enabled real-time integrity monitoring scans and find that some recommended rules produce too many events because they are monitoring directories that change frequently, you can disable real-time scanning for those rules. Go to Policies > Common Objects > Rules > Integrity Monitoring Rules and double-click the rule. On the Options tab, clear the Allow Real Time Monitoring checkbox. Integrity Monitoring rules should be as specific as possible to improve performance and to avoid conflicts and false positives. For example, do not create a rule that monitors the entire hard drive. It’s a best practice to run a new baseline scan after applying patches. On-demand scans: You can initiate an on-demand integrity monitoring scan as needed by opening the Computer editorTo open the Computer editor, go to the Computers page and double-click the computer that you want to edit (or select the computer and click Details)., and going to Integrity Monitoring > General. In the Integrity Scan section, click Scan for Integrity. Scheduled scans: You can schedule integrity monitoring scans just like other Deep Security operations. Deep Security checks the entities that are being monitored and identifies and records an event for any changes since the last time it performed a scan. Multiple changes to monitored entities between scans will not be tracked; only the last change will be detected. To detect and report multiple changes to an entity's state, consider increasing the frequency of scheduled scans (for example, daily instead of weekly) or enable real-time scanning for entities that change frequently. 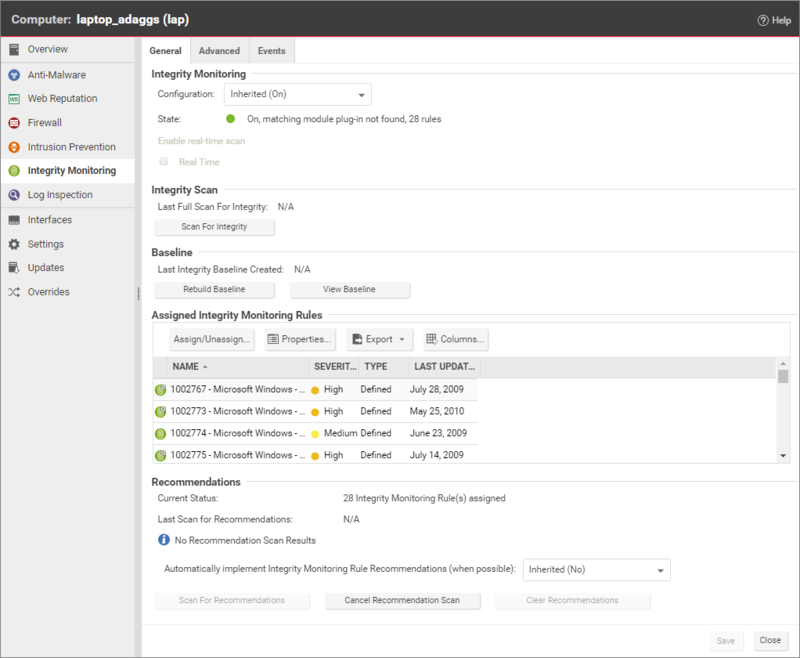 To enable scheduled integrity monitoring scans, go to Administration > Scheduled Tasks > New. In the New Scheduled Task Wizard, select Scan Computers for Integrity Changes and the frequency for the scheduled scan. Fill in the information requested by the New Scheduled Task Wizard with your desired specifications. For more information on scheduled tasks, see Schedule Deep Security to perform tasks. Real-time scans: You can enable real-time scanning. When this option is selected, Deep Security monitors entities for changes in real time and raises integrity monitoring events when it detects changes. Events are forwarded in real time via syslog to the SIEM or when the next heartbeat communication to the Deep Security Manager occurs. To enable real-time scans, go to the Computer or Policy EditorYou can change these settings for a policy or for a specific computer. To change the settings for a policy, go to the Polices page and double-click the policy that you want to edit (or select the policy and click Details). To change the settings for a computer, go to the Computers page and double-click the computer that you want to edit (or select the computer and click Details). > Integrity Monitoring > General and select Real Time. With Deep Security Agent 11.0 or higher on 64-bit Linux platforms, the real-time scan results indicate the user and process that changed the file. For details about which platforms support this feature, see Supported features by platform. To change the Integrity Monitoring CPU Usage Level setting, open the Computer or Policy editorYou can change these settings for a policy or for a specific computer. To change the settings for a policy, go to the Polices page and double-click the policy that you want to edit (or select the policy and click Details). To change the settings for a computer, go to the Computers page and double-click the computer that you want to edit (or select the computer and click Details). and go to Integrity Monitoring > Advanced. You can select the hash algorithm(s) that will be used by the Integrity Monitoring module to store baseline information. You can select more than one algorithm, but this is not recommended because of the detrimental effect on performance. Using scan caching for Integrity Monitoring improves the efficiency of scans by eliminating the unnecessary scanning of identical content across multiple VMs in large VMware deployments. To select which scan cache configuration is used by a virtual machine, open the Computer or Policy editorYou can change these settings for a policy or for a specific computer. To change the settings for a policy, go to the Polices page and double-click the policy that you want to edit (or select the policy and click Details). To change the settings for a computer, go to the Computers page and double-click the computer that you want to edit (or select the computer and click Details). and go to Integrity Monitoring > Advanced > VM Scan Cache.